" Red Rocks Trading Post - C 1958 - Park of Red Rocks - Colorado. " 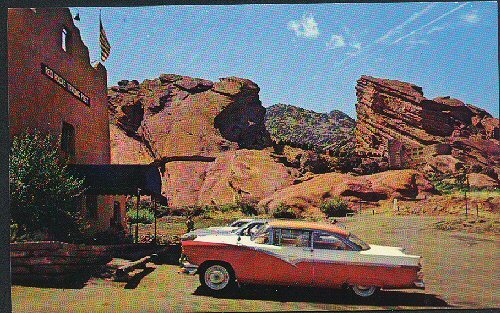 (1693) POSTCARD: Red Rocks Trading Post - C 1958 - Park of Red Rocks - Colorado. -Condition: Very Good.- Not Posted. Colored photo of building with a wonderful vintage car parked in front. Printed description states it is located about 15 miles from Denver and has an outdoor theatre with wonderful natural acoustics. Price: $3.00 + shipping.